We are very much open to new members, all writing genres, and all levels of writing experience from absolute beginners to bloggers to award winning poets and successful novelists and non-fiction authors. When we meet, we bring a piece of writing no longer then 3 pages (and a few copies). We have a lively and enthusiastic discussion, trying to discover where the author is going with it and what the potential of the piece is. Just come along even if you don't have anything to share (yet). 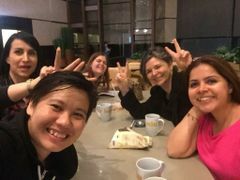 It will be fun to get to know other female writers in Bangkok!